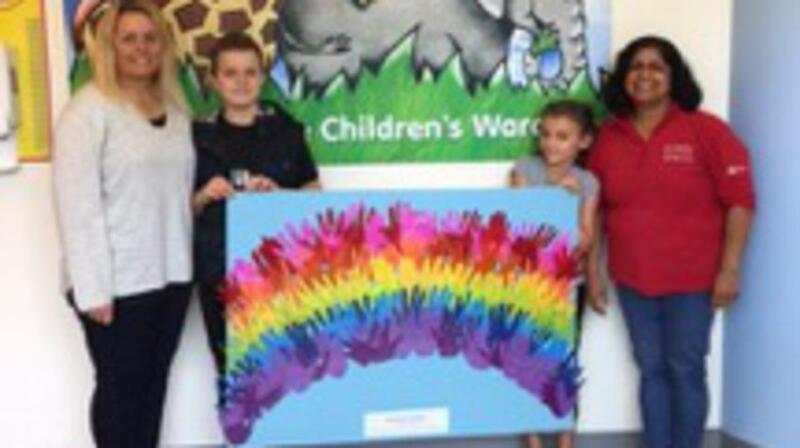 At the Huddersfield Stake Primary Fun Day, children made a collage to display at Calderdale Royal Hospital in Halifax, entitled ‘Rainbow Hands.’ The children traced their hands onto coloured paper, cut out the paper hands and assembled them in the form of a rainbow which was then presented to Becki Taylor, Play Specialist, at the hospital. Calderdale Royal Hospital provides elective and emergency treatment for children from birth (if they are born at term) to 18 years old. Becki informed everyone that toys and other equipment which the children at the hospital play with is all donated by parents. The primary decided to help further and members of Huddersfield Stake donated approved equipment, such as wooden and plastic toys, books and art material for future use.